My Nail Polish Diary: OPI Koala Bear-Y with China Glaze Hello Gorgeous! OPI Koala Bear-Y with China Glaze Hello Gorgeous! OPI Koala Bear-Y was released in 2007 in the Australia collection but I think it might be core now. 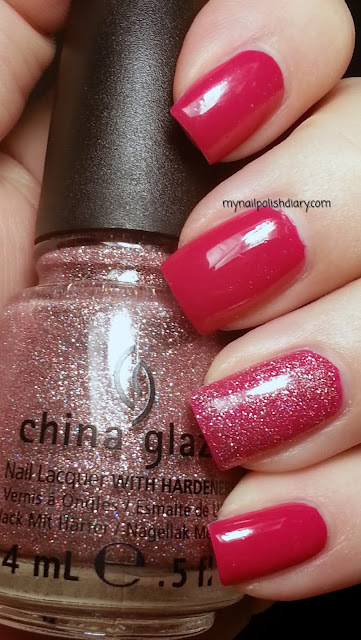 China Glaze Hello Gorgeous! was in the 2012 United in Purpose collection for breast cancer awareness. I wore this to Disney on Ice and boy did Hello Gorgeous! sparkle when the lights hit it! OPI Koala Bear-Y is a berry pink creme. It's one of my favorites because I love to wear this shade of pink. Application, formula, wear time...all perfect. China Glaze Hello Gorgeous! is a rosy pink micro glitter with tons of holographic glitter. It's so sparkly. I love this type of glitter. China Glaze has put several of these out and I have bought them all. I will buy them all every time :) It's not very textured so my normal mani routine of OPI Top Coat followed by SV quick dry top coat had it smooth as glass.